During the time he was writing Tactical Philanthropy, Sean was a regular speaker to major donors, foundations, nonprofits, college students and other groups interested in philanthropy. He consistently received top marks from audiences for his engaging presentations full of images and video clips. Sean is not currently accepting speaking engagements. Sean gave the keynote addresses at Full Circle Fund’s annual gathering. Sean spoke at a private event with the board as well as a public event for donors and financial advisors about the way the motivations driving charitable giving are changing and what this means for the future of philanthropy. Sean spoke to an audience of nonprofits, consultants, financial advisors and foundation professionals about the Second Great Wave of Philanthropy and how major donors are shifting their perspectives on what kinds of nonprofits they want to support. Sean gave a keynote address focusing on key trends in philanthropy and the emergent interest major donors have in “investing in nonprofits”. Sean gave a keynote address on the tension between logic and empathy — head and heart — in philanthropy, as well as spoke on a panel discussion about nonprofit evaluation and organizational analysis. Sean spoke at New Profit’s annual conference on a panel about how and to what degree nonprofit evaluation can help us direct more resources to programs and organizations that get results. Sean gave a speech on the topic of nonprofit results reporting and how donors should think about building capacity. Sean gave a keynote address to Britain’s largest nonprofit sector conference about key trends in philanthropy, the state of major donors and the key characteristics that tactical philanthropists look for in the nonprofits they support. Sean gave the opening keynote address on the role of information filtering in philanthropy as well as led a breakout session on social media and philanthropy. Sean gave a keynote speech on the role of influence in philanthropy and led a brainstorming session on how SVP can best use its influence to increase philanthropic impact. Sean led the opening plenary on the future of philanthropy and spoke on a panel about information sharing. Sean designed the Tactical Philanthropy track at the conference and spoke at numerous sessions as well as at the opening plenary. Sean spoke at this premier public affairs forum on the evolution of philanthropy’s role within the social capital markets. 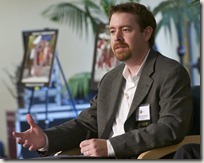 Sean spoke about social entrepreneurship and corporate philanthropy at this conference for grantmakers. Sean joined a panel of philanthropy industry experts to discuss the major trends shaping the sector. Sean talked about how university development programs can support “new philanthropists”. Sean joined Bob Ottenhoff, the CEO of GuideStar for a conversation about what major donors are looking for when they make proactive philanthropic investments. Listen here. Sean led a session on why social media offers a unique toolset for nonprofit fundraisers. Sean spoke on this panel about how technology has dramatically changed how ideas and values are developed and exchanged, how successes, failures and impacts are communicated and have shifted roles in philanthropic decision-making. Sean debated the role of foundations in providing capital to high performing nonprofits vs. their role in crafting their own programs with Paul Brest of the William & Flora Hewlett Foundation. Sean was a keynote speaker at this conference for university faculty and students interested in service learning. Sean spoke to the value of social media to philanthropic organizations. Sean joined a panel discussion on how investment advisors can best serve their clients philanthropic planning needs. Sean discussed philanthropic planning techniques and tools available for evaluating nonprofits. Sean was interviewed along with David Roberts of New Dominion Philanthropy Metrics by Tim Ogden of Philanthropy Action about why donors should consider qualitative information in their analysis of nonprofits. Listen to a replay here. Sean moderated a panel on the emergence of microfinance as a mainstream asset class. Sean joined Bob Ottenhoff, the CEO of Guidestar, Ken Berger, the CEO of Charity Navigator and other social sector leaders as they discussed the future of nonprofit analysis. Recording available here. Sean discussed the business of philanthropy advising in this talk show style conversation with Phil Cubeta, the director of the American College’s Chartered Advisor in Philanthropy program. Sean moderated a panel looking at how philanthropy can more effectively allocate funds to best meet community needs. Sean spoke at the morning plenary on the topic of The Changing Landscape of Philanthropy. Sean discussed philanthropic capital as part of a panel looking at the spectrum of capital from philanthropic to full market rate. Sean led a session examining SVPI’s role in sector-wide initiatives and on the use of social media tools in philanthropy. Sean spoke on a panel describing the spectrum of capital from philanthropic to blended rate to full market rate social investments. Sean sat on a panel discussing the emerging narrative of social impact and moderated a panel on social investing within donor advised funds. Sean joined Steve Gunderson, CEO of the Council on Foundations, Ian Wilhelm, Chronicle of Philanthropy, and Tom Fontana, creator of the NBC drama The Philanthropist to debate the importance of the show to philanthropy. Video of the debate here. Sean joined a panel including Sonal Shah, head of the White House Office of Social Innovation & Civic Participation, to discuss how to build partnerships between philanthropy, government, and civic organizations. Blog post about session here. Sean was a panelist along with Michael Smith of The Case Foundation and Kristen Taylor of the John S. & James L. Knight Foundation at the Taking Philanthropy Online session. Sean spoke at a session titled Foundations and Information: When to Share What You Know. Blog post about session here. Sean was a featured speaker on the implications of the growth of social media on the philanthropic sector. Sean lectured on Stanford Alumni Day in this one day course on philanthropy. Sean, Stacy Palmer, editor of The Chronicle of Philanthropy, and Matthew Bishop, editor of The Economist magazine US edition and author of the book Philanthrocapitalism, addressed the New York business press on the topic of how to cover philanthropy. Blog post about event here. Sean was the luncheon speaker on the topic of The Convergence of Wealth Management and Philanthropy. Sean spoke with panelists from the Ford Foundation, Wallace Foundation and the director of Philanthropic Services at Bank of America. Sean moderated this first Tactical Philanthropy forum that featured Paul Brest, the president of the William & Flora Hewlett foundation, and Bill Somerville, the president of the Philanthropic Ventures Foundation. The event sold out in seven days and attracted 110 paying guests. Video of event here. Sean moderated this session that attracted a standing room only crowd. The other panelists included Maximilian Martin, director of Philanthropic Services at UBS and Elliot Berger, director of Philanthropic Services at Merrill Lynch. Video of session here.